cheese.rox » Blog Archive » Battle of the Yard Signs!!! « Eat Your Hearts Out, Other Trick-or-Treators!!! Battle of the Yard Signs!!! Who will it be? 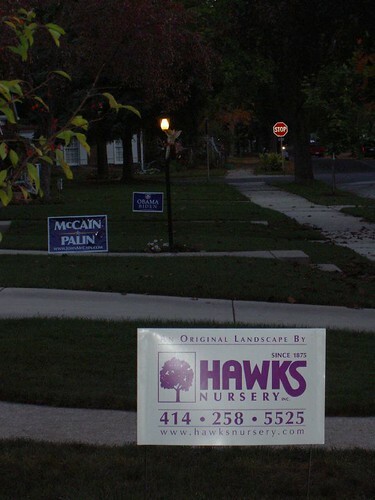 Barack/Biden, McCain/Palin, or Original Landscape by Hawks Nursery? The suspense on my street is getting thick! This entry was posted on Tuesday, October 21st, 2008 at 10:35 pm	and is filed under Funny, Politics. You can follow any responses to this entry through the RSS 2.0 feed. Both comments and pings are currently closed.